What manufacturing advances have been made on this program? When we set out to design and build the Citation Latitude we started with a cross-functional group to ensure all phases of the process would be integrated from the beginning. 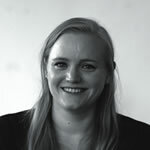 Mapping out details about how the first prototype is built all the way through how owners will experience aftermarket service and support, the teams built on their already extensive knowledge to further simplify processes wherever possible. The resulting innovations in tooling, parts design, and manufacturing and build techniques are allowing the Citation Latitude to hit every mark, again and again, throughout the program. We saw this effort in action with the installation of the first fully configured interior on the Citation Latitude demonstration aircraft, which debuted at NBAA in October 2014. Not only was the installation process flawless and completed ahead of schedule, but the finished product looked precise and elegant. How will these advances benefit customers? Advances in parts and tooling manufacturing and interior design and installation are key to increasing ease of maintenance throughout the life of the aircraft. But some of the most notable advances are those experienced when customers seamlessly transition from conference room to cabin with the greatest amount of efficiency and comfort. The Cessna Clairity wireless CMS enables passengers to control nearly every comfort and convenience touchpoint via their personal electronic device. Has the aircraft been outfitted with a VIP interior? The demonstrator aircraft that debuted at NBAA features a custom interior that is reflective of the color and material options customers can consider. It also has the standard nine-seat forward cabin configuration. This layout includes a belted two-place divan, forward refreshment center and standard aft lavatory configuration with belted side-facing seat. Customers can also choose from four standard color schemes, custom interiors and various seating configurations. What are the highlights of this aircraft’s interior? Every time we introduce a customer to the Citation Latitude they are overwhelmed by the spacious, bright cabin and refined interior amenities. The entirely new cabin experience coupled with the reliable, easy-flying DNA of a Citation is completely redefining how customers view the midsize segment. The Citation Latitude features an all-new fuselage, the widest of any Citation jet, as well as a flat cabin floor and 6ft cabin height. Cessna’s Clairity cabin-technology system ties into the Citation Latitude’s advanced Garmin G5000 avionics center to provide connectivity and productivity to each passenger through their personal electronic devices. Accommodating up to nine passengers, the Citation Latitude features a new cabin environment experience, with the pressurization system providing a 6,000ft cabin altitude at the aircraft’s maximum operating altitude of 45,000ft. What opportunities do owners have to customize the interior? Along with the four standard interior color and material schemes, customers have the option of choosing their own fully customized palette, various seating configurations, cabinetry options and finishes. Has the interior been tweaked since the program was announced? 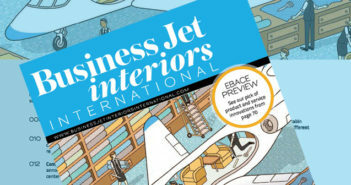 We knew as soon as we announced the Citation Latitude in 2011 that all the attention would be on the unique interior. The team set out the vision for a stunning cabin and delivered an aircraft that is getting a lot of attention. Have you taken on board feedback from current and potential customers? In true Cessna fashion, the team used customer feedback as the basis for the flat-floor, stand-up cabin design. It was also the inspiration for the interactive CMS. How do you ensure IFE and communication equipment is still up-to-date by the time the aircraft comes to market? Cessna’s Clairity wireless system features completely integrated cabin management capabilities. Updates to the system can be achieved via uploads as new consumer electronic technology comes to market. How challenging was it to integrate airbags in the cabin? 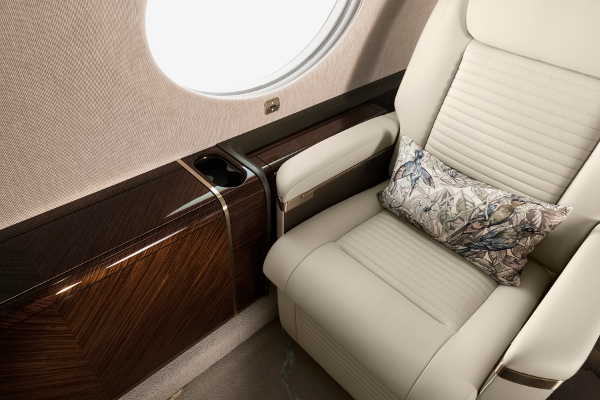 The Citation Latitude is the first business jet in the industry to feature cabin airbags for passengers in side-facing dual or single seating configurations. Taking a cue from automotive airbags, the system is the first to meet new FAA occupant protection requirements and extends the Citation’s heritage for continued safety innovation. What work is left to do before you can begin deliveries? We continue to make solid progress on the certification program with more than 500 flights and 1,200 hours accumulated to date. FAA certification is expected in the second quarter of 2015. What are you most proud of on this program? Our team is proud of the fact that customers are doing a double-take with the Citation Latitude. They know it’s a Citation, with all the value and ease of operation built in, but from cockpit to cabin, the aircraft presents a completely new experience. It’s exciting to see the feedback from customers combine with the expertise of the team in such a game-changing aircraft.